Take the Superstrada SS 223 for Grosseto and leave the highway (after 24.5 km) at the exit Terme di Petriolo. 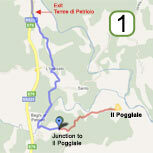 Follow signs to the Terme and after 4 km, having passed the Thermal Baths, turn left (at the sign Il Poggiale). Continue for another 2.5 km until you reach the Poggiale (entrance gates on your left). Take the Superstrada SS223 for Siena and exit the highway at km.40 (right after a tunnel 1 km long); after about 1.5 km turn left in the direction of Pari-Terme di Petriolo (on the old SS223 road)(B); continue for about 1.6 km and, after 2 crossroads, turn right at the sign "Il Poggiale" (C); after another 2.5 km you will reach the Poggiale (entrance gates on your left)(D).